San Manuel Stadium is an open-air ballpark in downtown San Bernardino, California, United States. 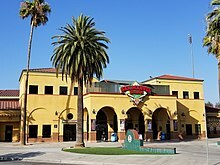 It opened in 1996, replacing Fiscalini Field as the home park of Minor League Baseball's Inland Empire 66ers of San Bernardino. Before then, the 66ers shared Fiscalini Field with CSUSB Coyotes and SBVC Wolverines. San Manuel Stadium is named after the San Manuel Band of Mission Indians, which is based in San Bernardino and paid for the naming rights. The stadium seats 8,000 people, with additional capacity provided by lawn seating. San Manuel Stadium was also the home field for the California State University, San Bernardino Coyotes baseball team. The Coyotes play in the California Collegiate Athletic Association in Division II of the National Collegiate Athletic Association NCAA. In 2004, it also served as the home of the Los Angeles Unity, the city's Pro Cricket team. In 2010, San Manuel Stadium was equipped with a new scoreboard, which is the largest in the California League. In 2010, CSUSB moved its home games to Fiscalini Field, San Bernardino's former minor league stadium. The San Manuel facilities are used by the San Bernardino Valley College's baseball team as well. ^ a b "About the Area". Loma Linda University. Retrieved March 4, 2014. ^ Sorba, Michael J. (April 10, 2010). "With New Score Board, 66ers Set for Home Opener Tonight". The San Bernardino Sun. Retrieved March 4, 2014. ^ Edwards, Andrew (December 28, 2009). "CSUSB Men's Baseball Team to Play at Fiscalini Field". The San Bernardino Sun. Retrieved March 4, 2014. This article about a baseball venue in California is a stub. You can help Wikipedia by expanding it. This page was last edited on 28 March 2019, at 14:55 (UTC).